The site occupied by Samuel South & Sons in White Hart Lane was acquired by them in three separate transactions over a period of some years. Research in the Middlesex Deeds Registry held at London Metropolitan Archives, and other material deposited at the House of Lords Records Office, has established the history of the acquisitions. The three sections of the site described below are identified on the following plan. 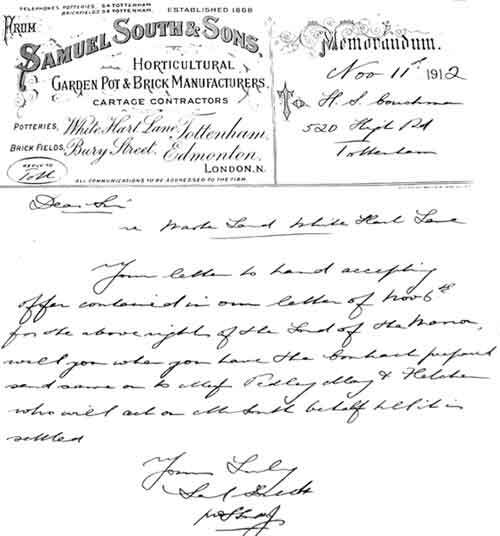 Samuel South(1) transferred his Edmonton pot making business to White Hart Lane in 1886 leasing 3 acres from Robert Kenworthy. By 1903 the land was owned by his widow, Elizabeth, and the following year Joshua Schonfield was the owner. Surprisingly, it was not until 1922, after the death of Samuel(1) (1919), that Samuel(2) had the opportunity to purchase the freehold. In 1915 Samuel(1) purchased the field of 5 acres, to the west of the initial site, from the London County Council which had acquired the land in 1901 as part of the estate bought for housing development. Samuel paid £1,800 together with the exchange of two pieces of land, totalling 4½ acres, owned by him to the north of River House. The land was used for the excavation of a new claypit. In 1936, Samuel(2) sold part of the land to R Strawbridge Ltd. who built the Wonderloaf bakery on the site. The New River Company sold off their Devonshire Hill Farm holding in separate lots in 1928 with Samuel(2) purchasing 22 acres for £9,000. In 1935 Samuel disposed of the bulk of this land to private developers but retained part of the field, around 7 acres, immediately to the north of the then existing pottery site for future clay workings. 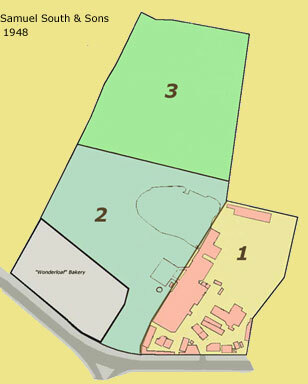 The three phases comprised the land sold in 1960 when the Potteries closed. In 1909 Samuel South(1) purchased Pipers Court, a house and land situated to the south of White Hart Lane some 200 yards east from the South Pottery. Later, the house was to be occupied by his son, John South. By 1912, Samuel had also bought River House and 35 acres of adjoining land which extended to the original route of White Hart Lane (now Compton Crescent). Abutting this land, opposite Pipers Court, there was a small piece of manorial waste land which Samuel sought to include with his land holding. Approaches were made to Couchmans, the agents for the Lord of the Manor, who also acted, on other occasions, for Samuel South & Sons.